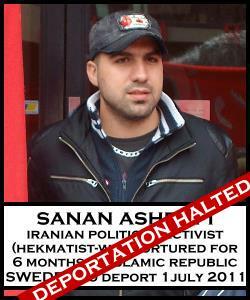 On Wednesday, 29 June 2011, just 2 days before he was scheduled to be deported by the Swedish government to Iran and to certain persecution, torture, and possibly execution, Sanan Ashrafi was granted a new hearing by the Migration Court Board. His deportation is no longer imminent. This is a victory for Sanan and a victory for all of humanity over the inhumane politics that characterize the right-wing coalition government of Sweden. We extend our warmest gratitude to all who assisted in bringing about this excellent turn of events, including Sanan’s lawyer Bo Johansson at the Swedish Refugee Advice Center, his fellow activists at the Worker-communist Party of Iran – Hekmatist, the member organizations of the International Coalition of the Rights of Iranian Refugees, our friends at the Southern Refugee Legal Aid Network, and all of our friends who once again rose to the occasion and wrote, called and faxed the Swedish government to demand an immediate halt to the crime being perpetrated. At the same time that we learned the good news about Sanan Ashrafi’s case, we also learned that only 2 weeks after her near-deportation from Sweden, Marzieh Kamangar was officially granted refugee status and permanent residence in Sweden. We continue to demand that no asylum-seeker be returned to the Islamic Republic of Iran, which has promised to prosecute all returned political asylum-seekers under Article 7 of the Islamic Penal Code. There are already several confirmed examples of refugees – even those deemed to be “non-political” – facing persecution after being returned to Iran; there are many more unconfirmed examples of the same. It is therefore illegal under international law to return any asylum-seeker to Iran. 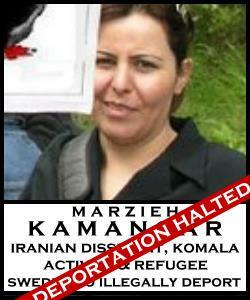 Very happy that the deportations of these two Iranian peope are halted.